The team at Broken Audio are always striving to find innovative ways of offering quality music. Their most recent offering was the Musical Currency USB Credit Card albums which were received with widespread acclaim, both in terms of the form and music offered. Within days, all copies were virtually sold out proving that substance is still very much desired in what can often seem a faceless digital music world. So along with the usual digital download components, each release will have its own limited edition lathe cut 10” vinyl dubplate featuring two of the tracks, lovingly presented in a hand made and numbered ‘jigsaw of art’ card sleeve. Collect all 9 dubplates and arrange the sleeves in a certain order to solve the puzzle and reveal a single larger image. Those purchasing the vinyl will also gain access to a selection of exclusive bonuses, such as a free WAV digital download of all tracks on the same release, plus bonus tracks that will not be made available on the digital release, and the odd Project Mohawk sticker thrown in for good measure. Without doubt, this is a unique musical compilation to be collected, enjoyed and treasured for many years to come. And if all that wasn’t enough…? 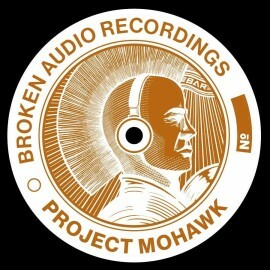 Everyone that buys a copy of any release in the Project Mohawk series (vinyl or digital) will be given the chance to enter a competition to win assorted label goodies and the star prize of an all expenses paid trip for 2 to one of the Broken Audio label events in Europe. Simply email a copy of your purchase receipts to Info @ Broken Audio and the guys will put all the names into a hat and pick the winners at random shortly after the release of the last EP in the series. Full details, including terms and conditions of entry can be downloaded in a zip file pdf format from here. Also available through iTunes, Juno and a host of other specialist retailers.